Dynamictexture started as a series of optical illusions web backgrounds. Besides that, the site features a blog where I publish some of my projects, some which aren’t even published here. This infographic shows different types of human traffic, or other ways of paying for human life, worldwide, from the ancient times to present. I’ve chose to design it like a spider web in order to be a metaphor for such a negative network from which once caught is hard to escape. Made for “The Kantar Information is Beautiful Awards” Knowledge is Beautiful Challenge. Published in the Shortlist. A minimalist clock displaying your local hour by showing how much from the Day (AM time – white), or from the Night (PM time – black) has passed. To view the other hours, move your mouse over it. “Information Graphics” by Sandra Rendgen, edited by Julius Wiedemann. I am happy to have 1 infographic included in it. Available in Cluj-Napoca Romania between 27 feb.-02 mar. 2012 (o sa anunt locatia probabil in Matei Corvin). An interactive/hand-made paper pie chart about The 2010 Global Emigration and Immigration. The visualization presents the 2010 global emigration and immigration, by showing the top 30 countries by the number of emigrants/immigrants, and all the rest of the world grouped by geographic regions, and shows where and how many people are migrating for each of these countries/regions. 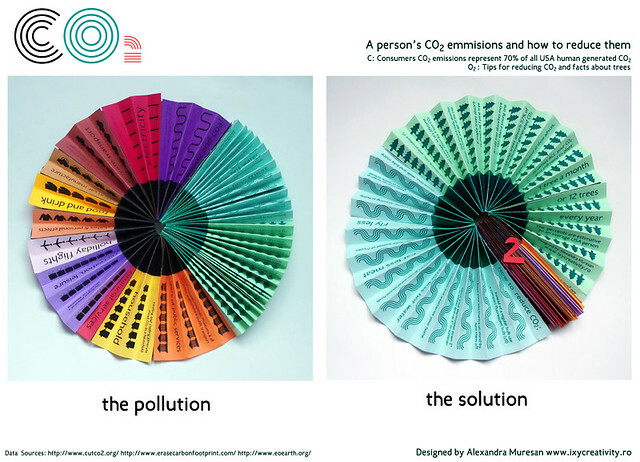 Visual Storytelling is a new dataviz book by Gestalten, which includes 2 of my works: The Paper Pie Chart, and The Individual CO2 Paper Pie Chart. The photographs below are taken by me in the same park I photographed the paper pie chart, a year ago. A data visualization about the world’s non-renewable resources – how long might they last? My entry for the UN Global Pulse – Visualizing the voices of the vulnerable challenge on visualizing.org. Optimized for HTML5 supporting browsers, specially Firefox. In Safari browser the arrows don’t work well, please scroll with your mouse instead. 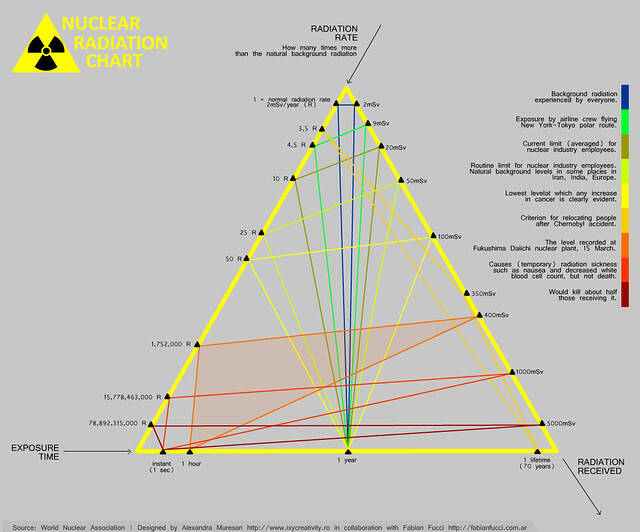 This “chart” shows the nuclear radiation data, and tries to explain the relationship between the numbers about radiation known to the public (right side of the triangle), from the media, such as 400mSv/hour recorded at Fukushima nuclear plant in 15 March, or 2mSv/year, the background radiation experienced by everyone and the same numbers but compared at the same unit (not per hour/year/instant/lifetime) – this is the radiation rate, which shows how many times more than normal the radiation is (left side of the triangle). Then, by having the chart arranged in a triangle, with the timeline at the bottom, the chart tries to give a clearer view on this issue. I made this chart in collaboration with Fabian Fucci, who has explained me this subject, stressed upon the role of the comparison which he made and the challenge of having it shown into 1 piece. My data visualization for Visualizing.org‘s Visualizing Urban Water Challenge. Ro: Martisoarele Butterflowers – martisoare hand-made, pictate cu acrylic (rezistent la apa), sub forma de brose sau felicitari. Ma gasiti in Piata Unirii, Cluj-Napoca, in spatele statuii lui Matei Corvin, in perioada 25.02.2011 – 02.03.2011. 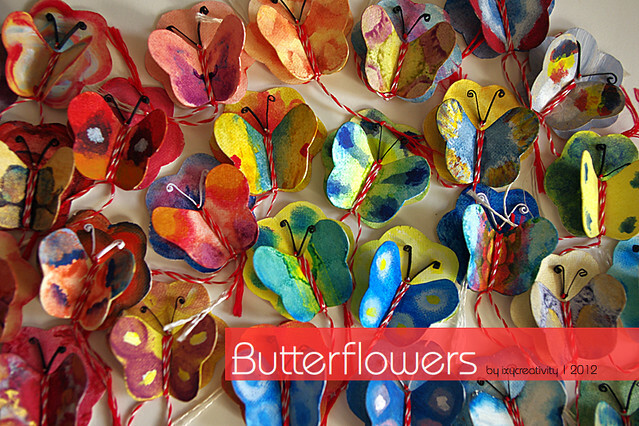 Acesti “Butterflowers” sunt o continuare a proiectului meu Butterflowers’ Garden de data ofline si hand-made. 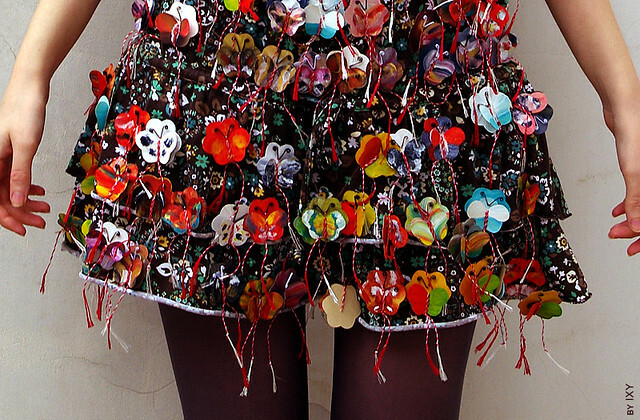 EN: “Martisoare” are little hand made crafts made to celebrate the arrival of spring, in Romanian tradition. People give them to one another, especially to kids and women at 1st March. I find my Butterflowers’ Garden a great symbol of spring and continued the Butterflowers’ Garden project with a series of painted Butterflowers that can be worn as accessories, and also greeting cards for this occasion. They are painted with acrylic, so they are water proof. If you are in Cluj-Napoca, Romania, during 25.02.2011 – 02.03.2011, you can find me selling them in Unirii Square, behind the Matei Corvin statue. Please view this page in FIREFOX, the tree shows well in FIREFOX only. 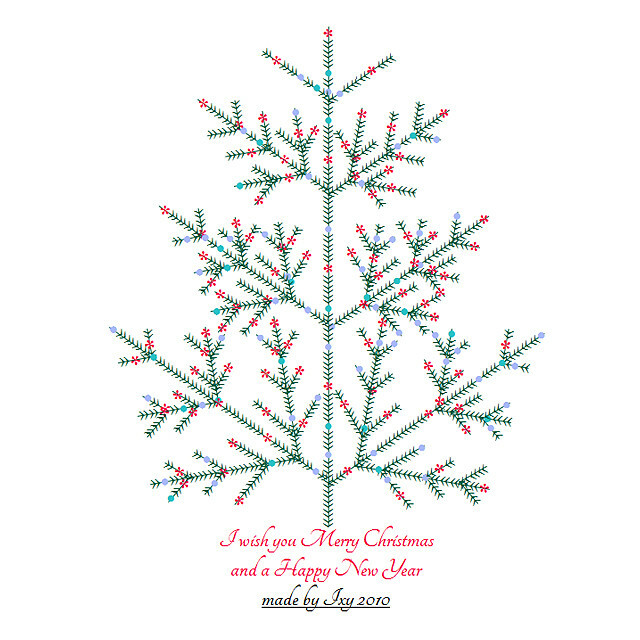 Made only in html and CSS3, the tree is a very long and complex paragraph. You can select it with your mouse – it has an interesting shake when selecting it. Individual CO2 emissions (for USA) vs. how to reduce them. The pollution data is organized in the shape of letter C, the remaining part, can be expanded to form a circle, O, revealing tips for reducing the CO2 emissions, and facts about the tree’s role in reducing CO2. The more the O expand, the smaller the C is. Made on printed colored paper, stitched, glued, then photographed. A selection from my illustrations and photos that are playful & available as prints in my redbubble shop. They are available in different formats, sizes and frames, such as greeting cards, postacards, matted prints, laminated prints, mounted prints, framed prints, and posters. A pie chart about paper made from paper . A new data visualization I made. Life expectancy for people born in 1990, 2000 and 2006 in various countries over the world, each continent’s highest and lowest life expectancy. First graph is a view through the 1990s – 2090s timeline, while the second one shows the same data, viewed by age. 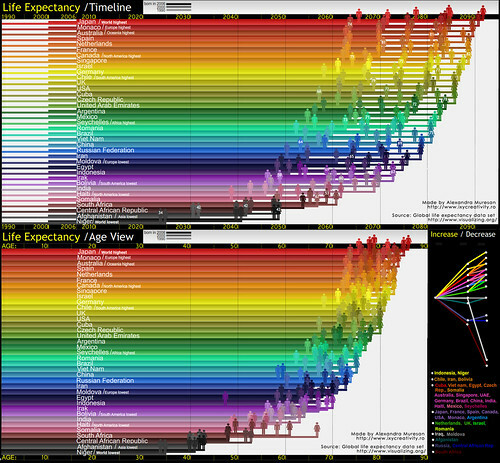 And a graph showing the increase/ decrease life expectancy patterns for those countries. The data comes from visualizing.org a new data viz online platform that launches today (1st Oct. 2010) at the Cooper Hewitt Design Conference in New York (live stream). Here is a link to the Data set. Updated the interactive section of my website. It now has more related information or images about the works, and a new design. And it’s on wordpress :). Below you can view some of my favorite works. Enjoy. Some illustrations drown constucted in html/css. They are made from divs, mainly just experiments with border-radius. Each element in the flower is a div, with position:absolute;. The rainbow is made from 4 divs one inside the other, positioned relative, colors are from border/background/border/background of each div, one inside the other. Oh, they work in Firefox, Chrome, Safari, Internet Exlporer and Opera – only if you want to see a sqare flower and a square rainbow. 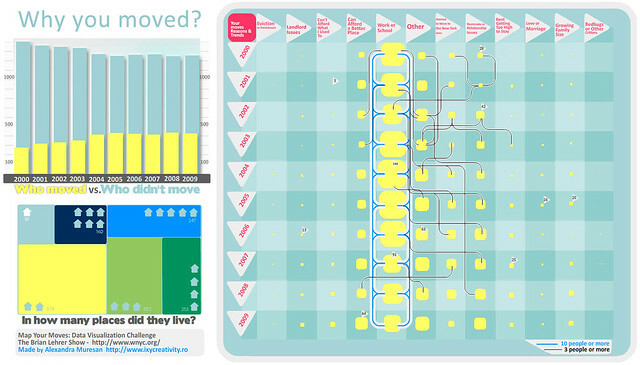 – Map Your Moves: Data Visualization Challenge. The data comes from a Census survey in which nearly 1700 people responded, which asked when, why, and where each person has moved over the last 10 years.